12 oz single from Highland Beverage, Birmingham, AL, USA. $2.19. 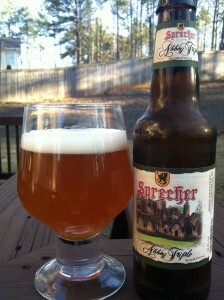 I simply really, really enjoy virtually everything that Sprecher does; I hope this is no exception. Pour is a nice, dark golden body with a small, white head. Retention and lace are not great, but considering the ABV, not too bad. A little solvent alcohol in the nose along with some fruit, I’m hoping the alcohol is turned down a little in the tastes. Plenty of bubblegum notes in the taste and the beer reveals lots of alcoholic fruit. Mouthfeel is not the most substantial, but that’s OK because it makes the beer even more drinkable and it has a creamy element. Some pineapple notes along with a little more tropical fruit, but it’s all alcohol soaked. A little white pepper and a few spice notes, but the beer is fruit and alcohol dominated. Some pear based esters start to come through as things warm. Some lovely, soft carbonation makes this a creamy beer which adds to the drinkability. Very smooth. Some dry notes in the back end, and not as sugary or as viscous as some in the style. The beer is warming on the way down. A bit of a paradox here – a relatively light and easy drinking Tripel, but still a beer that gives plenty of alcohol notes. Esters and alcohol are both in the ascendency but the beer still falls nicely into the style and does well in terms of its drinkability. It’s both a substantial delivery of EtOH but also a fairly approachable beer – odd. 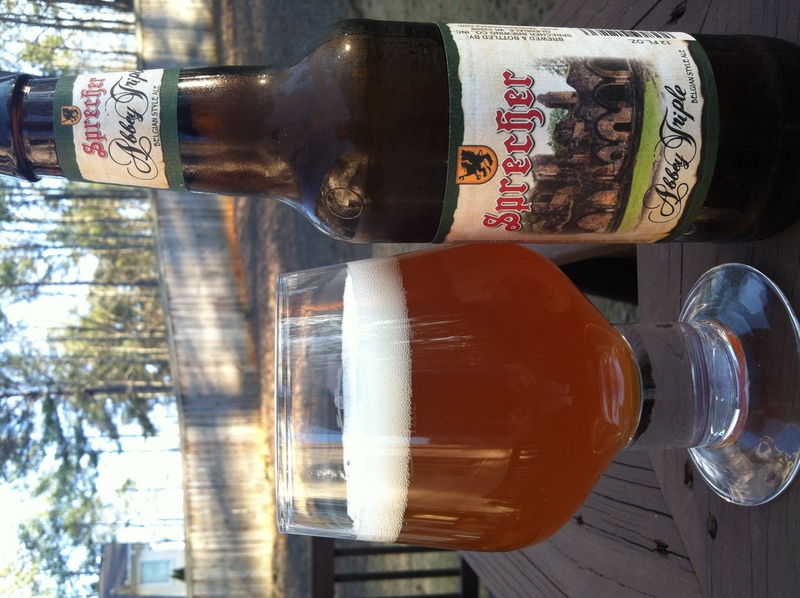 As ever, a tasty and very nice example of the style from Sprecher and my (general) admiration for them continues to build. Other: 8.4% and it delivers most of that.